Join the discussion on our forums! Come discuss Violet Haze over in our dedicated Violet Haze discussion topic. The deathrattle can be from another class, so it fits in a way similar to Face Collector, where it is not guaranteed to have thief synergy but sometimes it will. In standard there will be 48 neutral and rogue deathrattles and 43 from other classes, so on average about 1 of the 2 cards generated will work. The odds are good enough and the options limited enough for me to try it out in thief rogue. 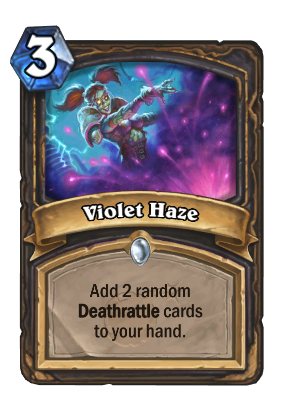 It pushes Deathrattle Rogue and the effect isn't horrible, how could I hate it? They could just have printed a deathrattle minion for rogue that has a decent effect. Right now Rogue, only triggers and discovers deathrattles (better ones from neutral) without having a powerful minion as her own. Her deathrattles often summon another card or just give tokens. Good spell for rogue? Great! The word "random" might cause it not to be staple but still pretty good for spellstones in the future once flower rotates out. Not bad. Would love to play this.